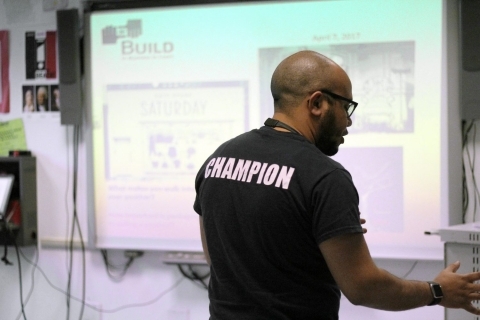 Our partner school Broome Street Academy’s 2016 graduation rate was so impressive that The Hechinger Report, a leading education website, and WNYC wanted to know how BSA and The Door did it. Read about Aminata, a 2017 graduate, and how The Door’s wraparound services make it possible for BSA students to get all the support they need to make it through high school, and beyond. Dental checkups are one of the many non-academic activities the 17-year-old senior does at school in between anthropology, English 12, and economics. On some afternoons, she might head to a doctor’s office for her annual physical, attend a speaking club meeting or visit with a clinician to hash out her worries about graduation and friend troubles. On some afternoons, she might head to a doctor’s office for her annual physical, attend a speaking club meeting or visit with a clinician to hash out her worries about graduation and friend troubles. Schools that provide low-income students with this kind of help — sometimes referred to as wrap-around services — are called community schools. Hundreds exist and hundreds more are opening. Their increasing popularity is based on the belief that students dealing with poverty and trauma at home simply can’t learn if their basic health and wellness issues aren’t taken care of first. Advocates include New York City Mayor Bill de Blasio, who has promised to open 100 new schools by the end of this year through his NYC Community Schools initiative, and another 69 schools in 2018. Congress joined the bandwagon as well; it added a community schools initiative in the Every Student Succeeds Act, the federal education law passed in 2015. Despite its increasing popularity, the model has had mixed results. But the results at Broome Street, a community school on steroids, have been stunning. The six-year-old charter is located inside a community-based organization, a five-story teen crisis center known as The Door. Advocates say that placing a community school inside a community organization is rare. But educators here say the arrangement is the secret to Broome Street’s success. Last year, 72.4 percent of the 87 students who arrived in 2012 as freshmen graduated on time, nearly matching the city’s four-year graduation rate of 72.6 percent. The numbers are impressive because Broome Street serves 324 of the city’s neediest teens, many of them homeless, or perennial couch surfers, looking for a place to stay because of tension inside chaotic homes, violent parents, or absent ones. Some have criminal records. Some have been prostitutes. Others have witnessed murders or spent hours of their childhood visiting parents in jail. In other words, there is a lot in their lives that gets in the way of classwork. The school utilizes much of The Door’s 55,000 square-foot space and its services: an extensive legal department staffed by 13 attorneys; a counseling center with six clinicians; dental and health clinics; an employment center; a robust roster of afterschool activities; and even the lobby ping pong table. Sometimes it’s unclear which players pinging the ball off the table are kids who have dropped by the 45-year-old teen center and which are students from the high school. “We share everything,” said Bailey Huguley, The Door’s director of programming. 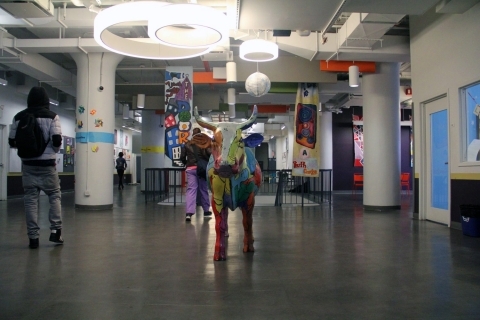 Broome Street Academy has a relaxed, but structured feel. Students are required to wear collared golf shirts sporting the school’s logo, but can pair the shirts with any pants or skirts they choose. A sign by the stairs announces: “You Don’t Have to Know Where You Are, But You Have to Have a Pass,” which seems particularly apt for students who may not know where they are spending the night. In between classes, students call out to each other: “Give me a hug,” or “You hanging out with me later?” Hanging out often means jamming in the building’s recording studio, making beaded bracelets in the art room or taking a poetry class on the first floor — all activities available after school. Students can even grab a bite to eat; dinner is served in the cafeteria at 5:30 p.m. Some teens are referred to The Door through staff at their own schools, or by caregivers and social service workers. Others arrive on their own. Many are homeless; some are run-aways. The Door also provides supportive housing. Teens must join The Door, free of charge, to use the facilities and services, which also include tutoring for the High School Equivalency diploma, employment assistance and legal aid. 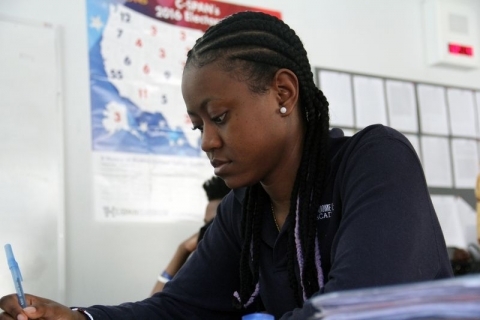 Sharing space means staff members at both the school and the organization often mingle and swap thoughts about students like Aminata: how she is doing with her coursework (well), her college search (she is still undecided) and her morale (up and down). Aminata is here in the United States without her parents, who are in Guinea. She emigrated from that West African country with her father, who has since returned there for a job. She now lives with her aunt and cousins in a small apartment in northeastern Brooklyn. She misses her parents, struggles with her aunt, and finds friend troubles all-consuming. Sharing a building also allows both the school and The Door to save money. But the biggest benefit is how much more efficiently staff can attend to student needs. When counselors at The Door sit with teens who hate school, they recommend that they apply upstairs to Broome Street. And when students at Broome Street need counseling, their teachers send them downstairs to The Door. Broome Street Principal Barbara Mckeon says the arrangement allows staff members to get students help ASAP, rather than hoping students will find the time, energy and subway fare to get themselves help later, which in teenage time may mean never. The school is the end result of a 2009 strategic plan drawn up by board members at The Door. They reasoned that having a school on-site would boost their own efforts to reach at-risk students and also offer those they already served high-quality schooling. The school receives financing from both the Department of Education and The Door, and has recently taken advantage of city grants for community schools. The benefits of the arrangement were in evidence during a recent health class, co-taught by a member of The Door staff and a Broome Street teacher. Students gathered around lab tables to talk about sexually transmitted diseases: what they are (the academic lesson) and how not to get them (personal health). The teachers handed students stuffed animals with tags stapled onto them that bore the names of different STD’s, including AIDs, herpes, and gonorrhea. The labels also outlined how each disease is contracted. Students spent several minutes talking about the different diseases. Then they were instructed to get up and form a circle with their stuffed animals in tow. Some were given latex gloves. Others were not. They were told to throw the animals to each other. And then the teacher explained what the gloves and the animals symbolized: If they had caught a bunch of stuffed animals without gloves on, they had likely contracted an STD, maybe more than one. “Those of you who had gloves on, how did you feel?” he asked the class. “I’m not getting any diseases!” shouted a third. The students without gloves looked around glumly. Teacher Christian Cabrera, the director of student services, and formerly an employee at The Door, says the relationship between the school and the center makes it easier to support the kids he teaches. He’s a popular confidant for many students, who sometimes interrupt his business classes to announce they must immediately talk to him. In the hallway, they recount life-altering worries. He hears, “I think I’m pregnant” more often than he would like. The occurrence is so common, Cabrera has a protocol. He waits until class is over, then ushers the student downstairs to the health center, introduces her to a clinician and slips away. For the student, this means immediate contact with a trusted adult to help sort out a looming crisis. For staff at Broome Street, it’s assurance that the student is in good hands. Research suggests that at-risk students do better when they get the kind of support community schools offer, says Marty Blank, director of the Coalition for Community Schools. Students in community schools have better nutrition, fewer suspensions, and higher attendance rates. Jane Quinn, vice president of community schools at The Children’s Aid Society, which partners with 22 schools in New York City, says the push for more community school is an “equity issue.” She says community schools offer poor students what most rich ones get as a matter of course: regular doctor and dentist visits, and enriching after-school activities that allow them to build bonds with many caring adults. But critics of the community school method worry that the time and attention spent on a student’s emotional and physical well-being inside a school setting may come at the expense of a focus on academics. Paul T. Hill, founder of the Center on Reinventing Public Education, has toured many such schools, including the now-famous Oyler Community Learning Center in Cincinnati, a school that has confounded educators because student performance has been lackluster, despite an expansive and thoughtful model. In 2015, less than half the students in its K-12 school graduated high school. Broome Street does not have an academic record that would impress middle class parents. The SAT scores of the school’s 324 students are well below the national average. But its graduation rate has steadily increased, almost doubling from the 37 percent rate for students who began as freshmen in 2011. Principal Mckeon, who arrived in 2013, has used the community model to create more academic accountability. She has developed an intense mentoring plan she calls The Champion Program, which requires all students to develop a strong, supportive relationship with a specific staff member who will push them, through daily in-person chats, phone calls and texts, to excel inside the classroom and out. Mckeon also uses an online reporting system that allows students and faculty to monitor how the student is doing academically and socially. Replicating Broome Street’s successful arrangement with The Door may be difficult. Few full-service community organizations have buildings of their own — or space to spare for an entire school in the buildings they have. But to hear Aminata talk, it might be worth thinking more about. This fall, as she was sitting in English class, trying to analyze passages of “The Brave New World” with her classmates, worry over friendship troubles got in the way. She closed her book, put her head on her desk, and began to tear up. Her English teacher ushered her outside. With her teacher by her side, Aminata had a good cry. Aminata says that teacher is not the only adult she can take her troubles to. Ask her about the others, and she ticks off a list, impatiently: “My principal, my Champion, my doctor at the clinic…” she trails off, frustrated she has to explain this to a visitor who still doesn’t get it. Then she raises her arm and fans the building lobby, in one dramatic gesture. “Everyone supports you here,” she said. This story was produced by The Hechinger Report, a nonprofit, independent news organization focused on inequality and innovation in education. All photos by Jackie Mader/The Hechinger Report.